As a designer, I’m continually having customers tell me that they want a card that “pops.” Some people may think that means they want a card that is a bright neon color and that jumps out at you. But I have come to understand that people, in general, want a card that stands out from the crowd. And how you achieve that, is not always the way one might think. If you want your custom business card to really “pop”, there are a few do’s and don’ts to keep in mind. The more information you have on a card, the harder it is to 1. Find what you are looking for and 2. Figure out the best way to reach you. Phone numbers, for example, are one way to simplify your card. How do you want your customer to call you? The main office? Your receptionist? Your cell phone? Why not direct all of your calls to one place? It’s a lot easier to determine where to call when you only give them one option. And how often do you use your fax machine? If very few of your customers actually fax you something, maybe consider leaving that off too. If they need it, they’ll ask for it. Do you have a business where you want people dropping in? If not, maybe it’s best to leave that off as well. At Primoprint, all of our business is done online, with companies all over the world. Very seldom do we have people who come into our physical offices. So there is no need for us to include our mailing address on our new cards. Social media has created a whole new world for communicating with customers. Letting people know which sites you are on can be important, but consider using the sites logo icon, rather than spelling out your entire handle. These sites have made it really simple for people to type in your name and find you. Sell yourself right with a high-resolution version of your logo. I’ve seen companies that appear to cut and paste their logo from a scan and then try to use it on their cards. Unfortunately, that will not print well and doesn’t make your company look very professional. If you don’t have a high-res file, consider hiring a graphic designer to recreate it for you. Most of the time this is a simple process and will be a lot cheaper than designing a new one from scratch. If you want to use a photo on your card, I recommend hiring a professional photographer to take it. Selfies are great for Facebook, not so much for your card. Put yourself in the best light with a beautiful photo, that was taken at a high resolution, by someone who knows how to make you look good! We’ve met with our in-house photographer and she provided us with six helpful tips on how to take better headshots for your business card. There are a million “cool” fonts out there. In every style, you can imagine. With a business card design, try to keep your fonts very basic. These are easier to read. It should complement your logo, but not have a robust stylistic feel to them. And make sure your font is large enough for people to understand. Small type always looks better, but depending on your clientele you may need to keep it a little more substantial. 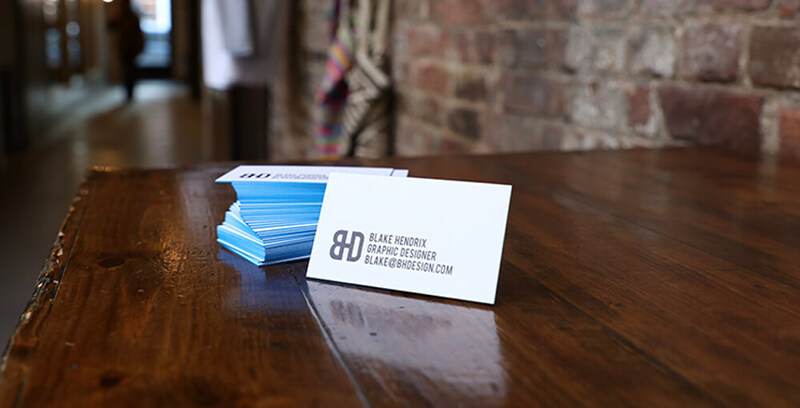 As with any business card design, the look of the card is very personal and subjective. What I like, you may not. And what works for my business may not work for yours. So find other cards that you desire and figure out what it is about those cards that make it successful. And if you need help, don’t be afraid to ask. The designers here at Primoprint would love to help you out! NextWhat is Bleed and Why do Print Files Require it?